It is a beautiful and detailed representation of St. Boniface Roman Catholic Church in Jersey City, NJ. ”St. Boniface was established to serve the once-flourishing German community of downtown Jersey City. A modest-sized, simple, and attractive Gothic Revival building, the church was opened in 1866. Purchase a framed print for the perfect decoration for any home. Choice of frames styles include black, white, oak, or rosewood. The high fidelity reproduction comes framed with a white mat and acrylic glass. 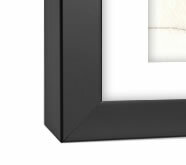 The size specified is the outside dimension of the frame.